Has your dog ran away from home or escaped? If you can answer yes to this question, there is no doubt a wireless dog fence is a great idea. No one wants to lose there beloved dog because they wandered onto the road or dug under the fence. Dog owners simply put want to keep their dog’s safe while allowing them to be free and run around as they are meant to. But sometimes letting your dog run wild can cause them to run away or simply not know their boundaries. This is where a wireless dog fence is one of the best solutions to the problem. If you have a big backyard and really want your dog to enjoy it to the fullest of extents then using a wireless fence is a great idea. The great thing about using a wireless fence is once the dog realizes where it should and shouldn’t be going after using it for a period of months or even weeks they won’t even need the collar at all. It’ also a great way to teach your dog boundaries of where he/she shouldn’t go and will mean a better trained dog and ultimately a dog you can safely let out even without the fence/collar enabled at all. After using over 20 different kinds of wireless dog fences and reading countless wireless dog fence reviews I have come to the conclusion of the best 3 options available on the market today counting down to the best wireless dog fence out there! When it comes finding an affordable wireless invisible fence this is definitely an option worth considering. While the functionality is more simple than other systems I have used it does exactly what it is set out to do. So how it works is you place the base unit which basically acts as the middle point of the effective area of the wired fence. Then on the device you set the range anywhere from 20 meters to 500 meters. When your dog tries to leave the designated area, and gets closer to the boundary the collar will start by sounding a warning tone then a static shock will turn on until your dog returns to the area within the invisible fence. The closer the dog gets to the boundary the stronger the shock will become. Though even at the highest setting it will not harm the dog. When the dog starts coming back to move back within the boundary the shock will lower and stop. The collar is designed to fit dogs 8 pounds and over and neck sizes from 6 inches to 26 inches. The collar has an integrated battery which is 300mA. What that equates to is about 12 hours of standby time or 8-10 hours of normal usage in my own testing. It can be easily recharged using the provided cables and batteries. The reason I really like this wireless fence for dogs is because of how easy the setup is. You can get up and running in 10-20 minutes and no other device can offer this convenience while it may not offer the precision of other devices it definitely works as you would expect and is great quality especially considering the low price point. 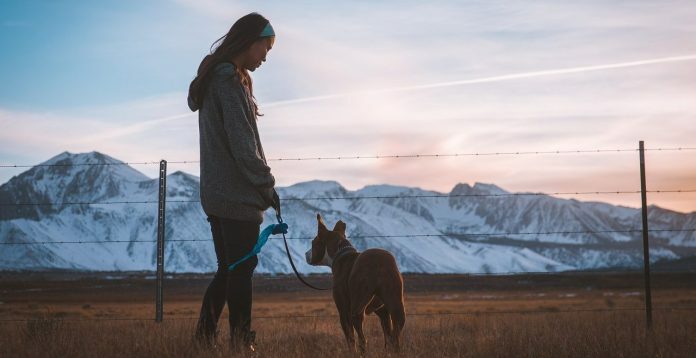 This PetSafe wireless fence allows you to create a wireless invisible fence with the range of up to 105 feet in all directions equating to ¾ acres. First off let me talk about the set up. This system comes with 2 main parts one being the main hub which transmits a radio signal from its position in a circular area around it, here you can alter the range and the intensity of the shock ranging from a 1-5. I would personally recommend testing it on yourself to understand the strength of each of the settings. Though on smaller dogs the 1-3 setting will more than likely be sufficient and from 3-5 for bigger dogs. Always start on the lower setting to start and adjust it from there. The set up only took me an hour to do and was very fast and efficient. The second component is of course the collar which has an included rechargeable battery which lasts for up to 3 weeks of usage. In my own testing, I could get about 2 weeks of usage but even for a heavy user charging it weekly will be more than sufficient. Recharging doesn’t take long either, you can go from empty to full in about 3 hours’ time. It’s worth mentioning that that collar is very capable of being worn by much smaller dogs and animals, it can also be worn by cats as well. If you have multiple pets you can use this on as many as you want all at the same time which is very convenient if you have more than 1 pet. 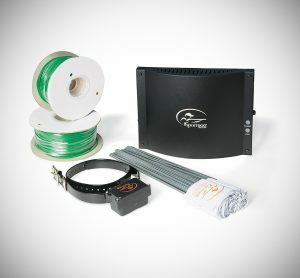 It’s worth noting that after reading some other wireless dog fence reviews for this product is that it works best on ground or areas that the ground is mostly flat and level, if where you plan to use it is sloping a lot then I would recommend you try another option instead like one of the wired options I have down below. When it comes to general functionality of this product is works perfectly as intended. 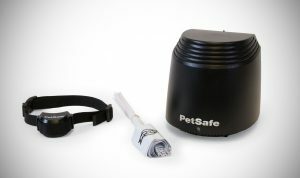 And after you have been using it for some weeks its quite likely that your pet will learn where it can and can’t go and then in some cases like mine you won’t need the use it at all, or just more for your own piece of mind to make sure you pet is always safe and secure. I highly recommend this product. 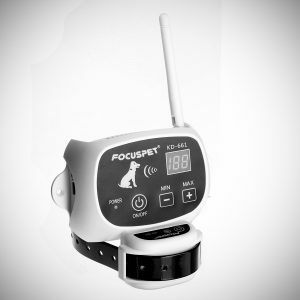 It’s a contender for the best wireless pet fence on the market today! 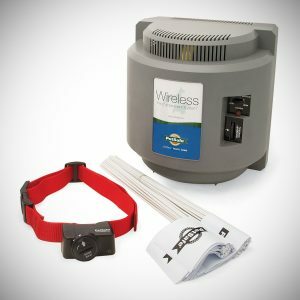 This PetSafe Wireless Pet Containment System is without a doubt the top rated invisible dog fence. It is the most versatile wireless dog fence that offers top notch quality along with being simple to set up and has all the right elements and features. Let me explain. The first thing that I really love about this is the set up. The set up took me about one hour. Basically, all you have to do in set up the unit at where you want the center of the effective fenced area to be. Usually it’s best to place it on the inside corner of your home or garage. Once the unit is in place you can adjust the boundary of up to 90 feet in all directions which equates to about ½ an acre of land. Once you have that done you can attach the collar to your dog and you up and running ready to get training. The collar and the system itself is a great choice of invisible fence for small dogs and will fit dogs of neck sizes from 6 inches – 28 inches. How the unit works is it basically creates a virtual fence that has a circular shape. When the dog gets nearer the fence/boundary a warning tone will sound and if your pet leaves the boundary it will stimulate the dog for up to 30 seconds if it remains outside the boundary. It will automatically shut off then if your pet is still outside the boundary for 5 minutes and then do the shock for 30 seconds again. Though in my usage the initial shock should be enough to teach your dog and then they will come back within the boundary and the stimulation will stop. The stimulation level can be adjusted from a low end of 1 to a high end of 5. I would recommend using it on yourself to see the sensation that your pet will feel. I also would suggest starting on the low setting of 1-2 so your pet can get used to the feeling more easily. For me having it on the 2 setting for my husky was more than enough for him to realize and understand his boundaries. So, start low and move it higher if you feel you need to. Battery life on collar is amazing, for me personally it lasted over 2 months on one set of batteries which compared to the other collars is much much better. After reading some other reviews of this product I see some people get as long as 4 months+ on one set. Of course, it depends on your amount of usage but needless to say battery life is amazing and you won’t have to worry about charging this often thanks to that. Also, there is a low life battery indicator so you know when the battery is running low. It’s also worth mentioning that the receiver is fully waterproof and has a nice material that is comfortable to wear. Overall this wireless dog fence does everything you need and has all the elements to make operation and a set up a breeze. This is an easy recommendation for me to make – this is the best wireless dog fence out there right now! Amazing battery life of 2-3 months! Considering a Wired Dog Fence Instead? Another option instead of a wireless fence is a wired fence – a fence that can be buried into the ground so it may as well be wireless – though set up will take a little longer than the wireless counterparts the advantages are also worth considering when comparing the 2. Below I have listed my personal 2 favorite wired fences and my overview on each of them. A wired dog fence operates almost identically when compared with a wireless fence. Though instead of the wireless radio waves creating the effective boundary you place the wire into the ground where you want the boundary to be. This SportDOG option is one of the best options when it comes to quality and value for money. Basically how it works is you lay the wire around(1000ft included) where you want the boundary and then connect to the transmitter on both ends. You can either lay the cabling on top of the grass and use grass staples like these like I did or you can dig it into the grass. It really is up to your preference. With what they have included in the box with 1000 ft of wire that is more than capable of surrounding an area of 1&1/3 acres. Though that can be expanded with more wire to up to 100 acres maximum. Also included in the box is a set of 100 flags which is where you can place along the boundary. I personally think this really helps the dog learn where the boundary is and if you are using it on a larger area of land it makes for finding the cable and adjusting it much easier. The collar has some options including both a tone and vibrations along with the shock as well. This is all powered by a typical 9volt battery which seems to last for an eternity and according to sportDog last anywhere from 6-12 months depending on usage which is insane. In terms of functionality it works perfectly and that precision that you get with the wire is definitely an important selling point. 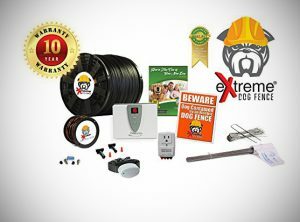 Extreme Dog Fence is another company that has developed an amazing product that really makes pet containment a doddle. When it comes to options and flexibility this wired dog fence is easily the best option. You can buy anything from a 1 dog system with 500 feet of wiring to an 5 dog system with 5000 feet of wiring. The set up was simple and really easy. The only thing that may take you some time is if you decide to bury the cable in the ground. Though I personally used garden staples and left it on the surface of the ground. When comparing this system to the previous one I a lot of the features and elements function the same though there are a few difference worth nothing. The similarities are great battery life and general collar design along with simple setup. The wire with this is definitely much thicker and more durable than the counterparts. This unit also does have a slighter better build quality and feels more tough and durable as well. Finally it’s also worth mentioning it has 10 year warranty which is often a sign of a top quality product and I can attest to that myself. This product does exactly what you want and need and everything included is of a higher quality, so it’s a great product overall and definitely worth your consideration. How Does a Wireless Fence Actually Work? Typically, on most wireless fences the main hub or transmitter is placed in a location of where you want the effective center of the fenced area to be. Then the transmitter emits a circular radio signal for the distance that you select. Once your pet leaves that boundary set by the radio signal they will be simulated using an electric shock or a vibration or noise will sound as well depending on the particular unit. A wireless fence is a great way to train your pet of staying inside where they are meant to be. Not only does this stop them from wondering off and getting lost or hurt but it can often train them rather quickly to know their own boundaries. In fact, a lot of dogs after using these systems for a period of weeks or months become well trained and after that point almost don’t need to use them at all. Keep your pet safe and protected. Keeps your pet within the boundaries and area that you set. Not as precise and accurate as a wired system. Can be inaccurate on sloping terrain. Important to not use near think metal walls as can interfere with radio signal. Wireless Fence or Traditional Fence? Though on initial impression a traditional fence may seem more secure for your pet this may not always be the case. Let’s say you have a traditional fence – your pet could potentially climb over it or dig under it. If you instead had a wireless fence your pet with regardless get the stimulation if they passed the invisible line and therefore should do a better job in teaching them and training them their boundaries. Also, a traditional fence is most likely going to cost you a lot more particularly if you have a larger area of land. Having a regular fence will not train them or teach them it will typically just prevent them from moving. Whereas a wireless fence will teach them their boundaries instead. A traditional fence doesn’t need to be charged or plugged it like a wireless fence but it requires its on maintenance. Both options have their own pros and cons and it’s up to you to decide with is the best option for you. There are a couple of main differences when comparing a wired fence vs a wireless one. A wireless one has a faster setup and usually can be up and running in under an hour whereas a wired option – if you are putting your wire underground it could take you all day or even longer if you have a large piece of land. The wired option will offer you better precision of choosing where you want the boundary to be whereas wireless will only let you choose the distance in a circular fashion and thus isn’t as precise. So basically, comparing the 2 options is if you prefer a faster setup that you can use even when camping and the like wireless should be your choice or do you prefer a more precise option with wired but you have to spend more time to set up. The choice is yours and depends a lot on your preference and usage. The final thing I want to mention in this article is some things to consider when making your purchase. Thank you for reading my buyers guide, I hope I have helped you in making the best choice to keep your pet safe and protected and within the invisible walls! Unchewable Leash – The Toughest Leashes Out There!